I am familiar with other examples at the Rocky Mountain Philatelic Library (RMPL) in Denver where I am a volunteer. One donation was from the estate of a longtime collector of Japan and China. His papers included several binders of non-philatelic articles related to the history and culture of those countries. Still to be sorted at RMPL are several boxes of papers accumulated by one of RMPL’s founding members who was expert in U.S. Classic issues. Tara Murray touched on two important points in dealing with archives: time and the availability of volunteers to categorize this material. It is important to note that volunteers do not need to be either credentialed librarians or professional archivists in order to sort, organize, and categorize material that relates to the philatelic hobby. But they do need to establish a “game plan” and can use some guidance as they start the process. Casting about for that kind of guidance, I first checked the APRL online catalog and found 353 entries under its designation of “Archive.” Browsing among those entries, I came across one “finding aid/guide” stating that it was prepared in accordance with instructions from a particular publication, Organizing Archival Records: A Practical Method of Arrangement and Description for Small Archives, by David W. Carmicheal (published by AltaMira Press). There are three editions of this 134-page book with the latest one, published in October, 2012, advancing the topic into a computerized world that already has spurted ahead of even a few years ago. Nevertheless, this easy-to-follow, easy-to-use paperback edition gives the volunteer the basic tools to arrange and describe archival material while also fostering a sense of confidence that a non-professional can accomplish these time-consuming tasks. Future philatelic researchers will thank you. 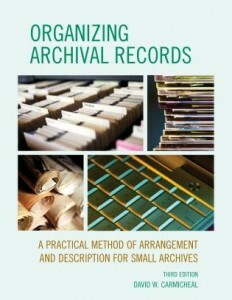 I used a no-cost interlibrary loan system to borrow my copy of Organizing Archival Records, but copies are for sale through online booksellers or from the publisher (where an electronic version is also available), https://rowman.com. You can look at ARPL’s 300+ archival entries by going to the online Philatelic Union Catalog (http://catalog.stamplibrary.org) and searching on “Archive” in the Record Type box. Finding guides are attached to some entries there to further help the beginning archivist.